*SWALL activates all weapons and god mode. *Ninjas are less aggressive than they are in the final game. *Coolies are much less durable than they are in the final game. *The Guardian Head is in the prototype and works as a flamethrower. *The Rocket Launcher seems to kill everyone in the room when fired. *Individual Shotgun blasts seem to be more powerful than they are in the final game. *The Railgun has an incomplete sprite, but fires faster than it does in the final game. 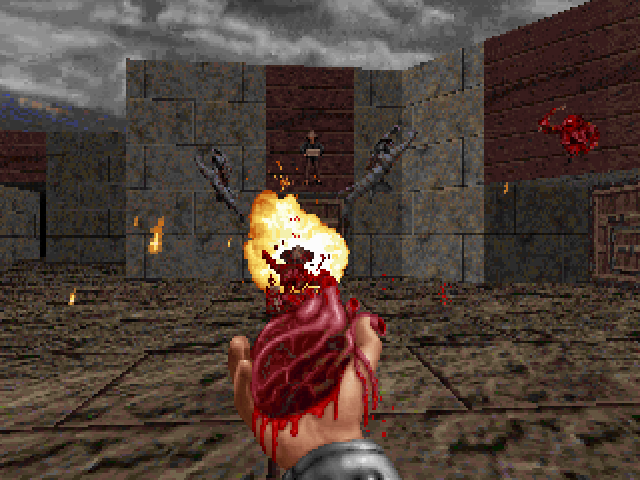 *The Ripper Heart shoots a single projectile at foes. *You use the same sprite than enemy ninjas do. *Your jumping and landing after jumping sounds are the same as Lameduke's. *The status bar does not accuratly keep track of how much ammo you have for each gun. *Some sprites for the old ninja are still in the game, mainly most of the suicide sprites. *The old player sprite is still in as well, though it only has basic rotations. *The Coolie Ghost uses a mix of final and old sprites. *The old shuriken sprite, seen in 1995 shots, is still in the game. 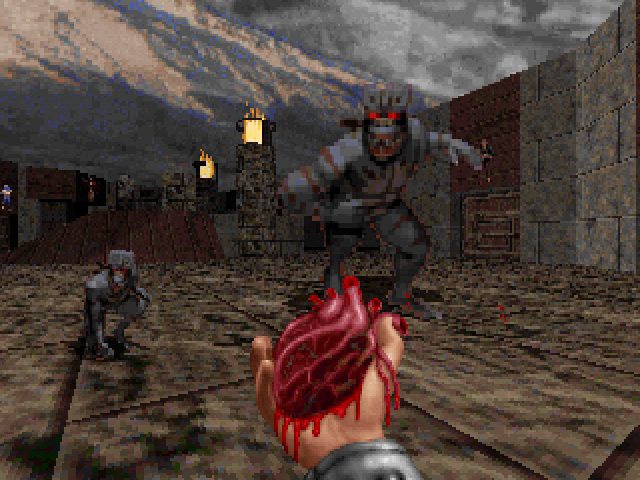 The Ripper Heart also performs a unique death effect. When a projectile lands on an enemy, they'll start bleeding profusely and take sustained damage for a period of time. When death occurs, the enemy will burst into two tiny Rippers. And by tiny Ripper, I don't mean the Baby Ripper counterpart of the retail game's adult Ripper. I mean an actual shrunken Rippers. And that's not the end of the interesting things here. The Rippers in the alpha are immune to taking damage from the Ripper Heart's projectile, but the shots do induce an effect: Rippers will grow with each projectile, eventually reaching a size akin to the giant Baby Rippers in the final game. You forgot SWITEMS and SWWARP###, they're all in the executable. To fix the horrid flickering in the Alpha, go to gameroot\beta1996 and open dosbox_swarrior.conf, and scroll down to where it says "machine", and set from svga_s3 to vesa_nolfb. Problem solved. I still haven't investigated, but let's just say, this is really, REALLY great!! A lot of thanks to anybody who had a part in making this possible, no matter how small it is (as long as it contributed to the release). 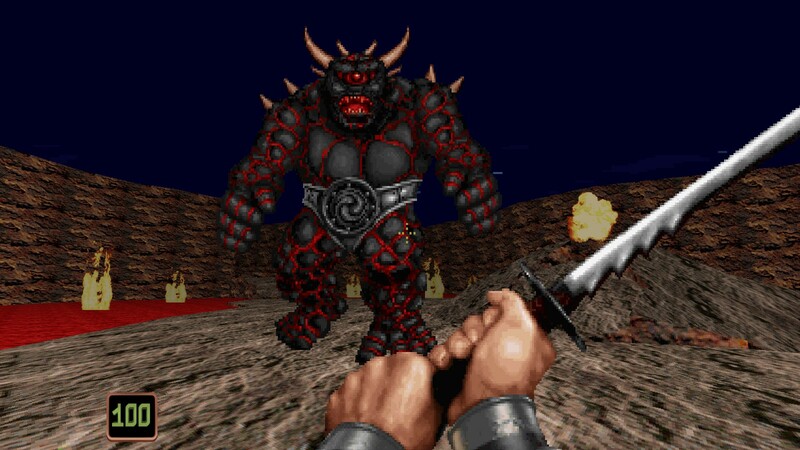 One note to add: If any of you got Shadow Warrior (Classic) from the 3D Realms Anthology, it does *not* include the betas. Awesome. Will try this in the next couple of days. Aside from Robman being an idiot, since the game is free to download on steam, is it legal to redistribute sw.grp and its contents? 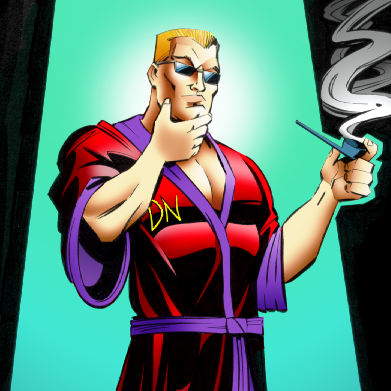 The use case being a Shadow Warrior mod, and a public facing github that might have all the data extracted into a "data" folder for example. Talk like this could probably stop, at least for awhile. Come on, man. After all the insults you fling to everyone who has a differing opinion? That could stop too. Because chances are that this thread wouldn't exist right here this day if I hadn't pursued the topic. Call me an idiot elsewhere if you like. But this thread deserves a little better than that. 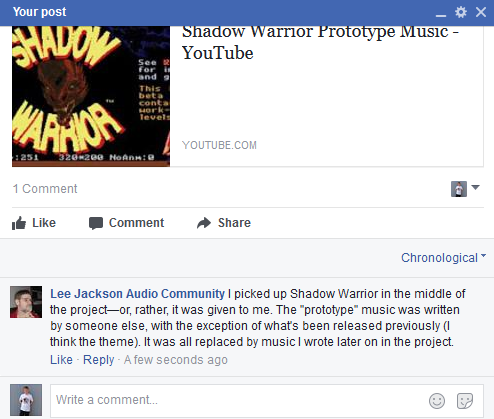 I posted about this on another topic, but Evan or Richard have you guys folder older Shadow Warrior code drops? It would not only be interesting to see how the game evolved from a engineering stand point, but it would be nice to have a drop that has working multiplayer. I doubt lot of people will care but the android port of SW is good, plays really well with bluetooth gamepad. Is it just me or does the alpha version has a massive problem with controls? A lot of inputs don't seem to register. There's tons of stuff in the 1996 version! I'm assuming the 6 others Hendricks mentions are earlier than this one, and some might be later builds. This 1996 version seems to be closer to what is seen in the previews found on the DN3D disc, and it may even be the version found, unless they used a further updated version of this one for the preview shots. None of the midis have any names to them aside from TYTAIK16.mid which lists a Tyler Tullock. We have semi-weekly backups stretching back years. I'm not sure how you're expecting beta code to be any better than the final release. I tried comparing and couldn't find any differences between the latest code and the official source release. Maybe the whole "this code is beta" understanding is because SW is just buggy in general. I'm pretty sure that if a screenshot was taken of it, we have it. So, assuming if they released the others the way they did with these two, what would they be able to do about the one that cannot be ran? Would it just be included with the rest, but without the option of running it, meaning that you have to go to the files and view it? The executable of this prototype (1995-09-08) is protected by a parallel port dongle named AEGIS that I have been unable to defeat. The assets are unencrypted. This will be updated once I have bypassed the protections. But just like I was trying to avoid, I have no involvement with these releases beyond waving goodbye to the data. The demos are incredibly desynchronized, but each of them has "Run mode off" message at the start. Maybe they were recorded with run mode enabled on an older version of the game, thus ending up desynchronized? Heads up: The Lava Boss works in this prototype! He will follow you and will fire large rocks at you. Each rock is extremely strong, to the point where it'll take no more than 2 of them to kill you. Since the game will automatically spew gibs at the point of impact whenever you get hit by one, it seems the intention was that one rock would be needed to kill you. He still has a single sprite, but it will occasionally rotate while moving around. In my opinion, he was removed because he was never properly developed. You can find him in the same map the 1997 beta has him: !boss2.map. I think it's because 'S' and 'W' are used to start a cheat code input, which will then ignore the next few keys pressed. I haven't tried this, but changing the keys to arrows or something might improve things. I (edit: just now) sent Termit the six betas and also emailed Nigel asking for Devolver to give permission. Enough to turn large chunks of it into a playable mod for the final version with minimal changes and effort? I sent Termit the six betas and also emailed Nigel asking for Devolver to give permission. I see you've edited your post to read "just now" - a wise change. I'll keep the post up on the next page that explains the timeline anyway. Heads up: The Lava Boss works in this prototype!